I know what you’re thinking – a blog about Jollof Rice – really?? Yes, really! Social media has been buzzing with this West African tomato-based rice dish and fueling an intense competition especially between Ghana and Nigeria about whose Jollof rice tastes better. Honestly, it doesn’t matter. The point is, it’s a beautiful dish and perhaps its beauty lies in the fact that it’s cooked differently in different countries. West Africans are proudly protective of this dish so much so that when Jamie Oliver “modernized” the dish with non traditional elements like coriander, parsley and lemon wedges, West Africans all over the world went crazy! So, what is it about Jollof that creates all this frenzy? Glad you asked. There seems to be some consensus that Jollof rice originated from the Wolof – an ethnic group from Senegal and Gambia. However, if Wikipedia is anything to go by, then the origins of this fabulous dish are not conclusive. One historian, James C. McCann, says that the origin in the Senegambian region is plausible given the popularity of rice in the upper Niger valley. However, he also says it is unlikely that the dish could have spread from Senegal to its current range since such a diffusion is not seen in “linguistic, historical or political patterns”. I suppose the questions about its origin only adds more “spice”to the Jollof debate. It also says a lot about the Ghana-Nigeria competition. Neither countries are contenders in the origins of Jollof rice yet, they make the most noise. The rivalry between these two countries is legendary and hilarious. Recently, a Nigerian expat in Ghana tweeted his experiences and it went viral. Tweets like “I’m about to eat Ghanaian Jollof; I cover myself in the blood of Jesus” had me in stitches. Then it so happened that the restaurant had run out of Jollof. With relief, he tweeted that he was now sure that his mothers prayers have been working. Jollof rice can be used as a term of endearment or appreciation for fine things. So be flattered if bae calls you my beautiful Jollof rice 🙂 Take a look at the fine specimens below. That is FINE Ghanaian Jollof right there. 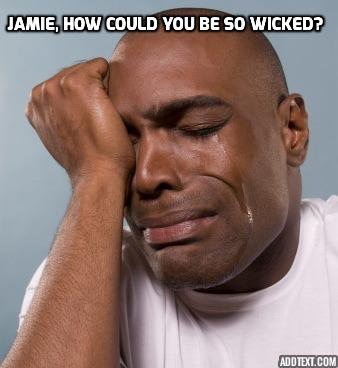 This for me was one of the most entertaining social media frenzy – a pity, it was at Jamie’s expense. It was all rather silly but it exploded and received quite a bit of press. Jamie’s crime was that he had messed with a sacred dish – you just don’t mess with jollof rice! So, with the jollofgate, came the hashtags: #bringbackourjollof, #jollofobituary, #deathbylemons. The best part of Jollof rice is the burnt part sticking to the bottom of the pan. It is smoky and crunchy. Delicious! I live for it! I enjoy every minute of the rivalry, humor and frenzy around Jollof rice. 7. So, who makes the best Jollof? Photo credits: theodysseyonline.com, myafricanfoodmap.com, evseats.com, foodlandfairy, https://food.good.is/articles/jollof-rice-africa-food-wars, bellanaija.com, pinhumour.com, oasisconnect ng, lipstick alley. Posted in Arts, Places and Culture, Uncategorized and tagged african food, cooking, Ghana, humour, jollof, jollof rice, nigeria, rice, Senegal, west african food. Bookmark the permalink. What of the black stars refusing to play in Brazil unless Jollof was delivered? Hahahaha! The rivalry lives on ✊🏾. Thanks for stopping by.